Can technology restore humanity to healthcare? Ask physicians how the feel about electronic health records, or read Atul Gawande’s recent New Yorker feature, “Why Doctors Hate Their Computers,” and it’s apparent that most healthcare professionals’ relationship with technology is ambivalent at best. At HIMSS19 in Orlando, in one of the new TED Talk-style SPARK Sessions, titled “Humanity and Technology in Medicine: Antithetic or Symbiotic?” Derienzo will explain why. The reason technology seems to pull us away from people, rather than bring us together, mostly boils down to “how we’ve designed it and what we’ve designed,” Derienzo said. But rethinking both of those, IT could be repositioned in a way where it enhances, rather than detracts, from the clinician and patient experience. “If we focus on the right types of technology, and we build it right, then we can actually use it to empower people to do more of the things that only people can do in healthcare,” said Derienzo. EHRs, on the other hand, were not designed with joy in mind. They were developed under certain conditions, with necessary check-the-box functionalities related to regulatory compliance and billing capture. In the meantime, he sees one technology doing a lot to return humanity to healthcare. One that may seem ironic, to say the least, given the trepidations many have about its potential to disrupt and displace: artificial intelligence. “AI stands positioned to be one of the core technological advances that allows us to return humanity to healthcare,” he said. That’s a fairly AI application, “but its purpose is to pull out things that people don’t have to be doing so now my care manager team can spend less time wondering who to focus on and more time actually focusing on people,” said Derienzo. Ditto with radiology, he said: “I don’t think that reading a thousand normal chest X-rays brings radiologist a ton of joy. But doing the really complex work – is it this, is it that? – is what they enjoy. How do we bring the expertise and brains of these terrific musculoskeletal and neuroradiologists tp the things we actually need them to be doing? That is how something like AI can actually empower humans. The practice of medicine is an ancient art, and one that’s long depended on the power of human interaction, he explained. “At one point that was all we had – other than leeches and bloodletting, all we had was the ability to interact with our patients one on one and be human with them,” said Derienzo. Providers are increasingly turning to payment technologies to collect patient bills and improve the customer experience, a new Billing Tree survey finds. The top two factors affecting choice of payment processing services were HIPAA compliance and the price of payment processing. Half of the respondents were collection firms, one-fifth were long-term care facilities and the rest were multi- and single-site businesses. Efforts to boost hospital finances are fueling activity in revenue cycle management as more providers look for ways to work with patients on payment plans. According to a Connance survey, 70% of providers claim it takes more than a month to collect from patients. A 2017 Advisory Board analysis found the average 350-bed hospital lost up to $22 million in revenue due to revenue cycle issues. The major EHR vendors, as well as other third-party players, are investing in RCM solutions as demand for services increases. In an earnings call earlier this year, Cerner officials highlighted RCM as a good growth opportunity, along with population health. Allscripts CEO Paul Black has also touted strong sales of RCM products. The trend is also spurring consolidation as vendors vie for market share. In February, Chicago-based R1 RCM snapped up Intermedix’s healthcare division, which includes physician and emergency services RCM, practice management and analytics. The acquisition increased R1’s capability to integrate revenue cycles across care settings, the company said at the time, citing Intermedix’s more than 15,000 providers nationwide. Survey respondents showed a willingness to accept a wide range of payment types. More than nine in 10 accepted health savings accounts and flexible spending accounts, 82% accepted paper checks or money orders and about 73% accepted credit/debit payments and electronic checks. The survey also shows growing use of automation, with nearly two-thirds reporting acceptance of web portal payments. In addition, 27% offered payment by an interactive voice response system and the same percentage offered payment by text. Asked what payment technology they would most likely add in the next 12 months, more than half (54.5%) said web payments. Not surprising given the growth in text payments, more than a quarter planned to deploy text notifications for payments and billing notifications. The House Veterans’ Affairs Committee’s Technology Modernization Subcommittee took aim at the VA’s EHR modernization project, an estimated $16.1 billion no-bid contract awarded to Cerner, with many skeptical the agency had overcome its years of problems. The EHR implementation, expected to conclude in March of 2020, has been riddled with roadblocks. John Windom, executive director of the fledgling Office of Electronic Health Record Modernization (OEHRM), sought to assuage the committee’s concerns by sharing project milestones and detailing the level of oversight his office has implemented to manage the transition. The project’s problems have ranged from “mundane to esoteric,” according to Banks. The undertaking certainly got off to a rocky start after Cerner ran into interoperability issues immediately after signing the contract in June of 2017. That contract, originally priced at $10 billion, was re-estimated at $16.1 billion once the VA remembered to account for staffing. The snafus haven’t stopped since. Genevieve Morris, who served as interim chief health information officer at the newly-created OEHRM, resigned from her post after one month, citing differences in opinion. Last month, in what some might perceive to be a red flag, Cerner subcontracted a coalition of 24 businesses to help with the VA EHR implementation, including Accenture, AbleVets and Leidos, the firm contracted to implement a twin Cerner EHR at the Department of Defense. Staffing and leadership issues aside, technical problems remain. Nearly all of the computers at implementation sites in Spokane and Seattle, for example, are reportedly incompatible with Cerner and need to be replaced, according to Banks. To that end, Windom shared recent decisions made to improve efficiencies, including improved coordination with the DoD’s implementation of its MHS Genesis EHR system, the adoption of a new change management strategy and trimming fat within the budget, particularly around staffing — while OEHRM was originally budgeted for 700 people, Windom said he’s kept it at 269. Asked about how he’s handling historic inter-agency fractures that have and may continue to impede progress, Windom was optimistic. Athenahealth has agreed to be acquired by a Veritas Capital and Evergreen Coast Capital affiliate for $5.7 billion, the companies announced Monday morning. Athenahealth will continue to be its own brand, but Veritas and Evergreen will merge it with Virence Health, the analytics and software firm formerly known as the Value-Based Care Solutions Group, which GE Healthcare acquired earlier in 2018. Virence Chairman and CEO Bob Segert will lead the newly combined company. “Combining with Virence will create new opportunities for collaboration and growth,” Athenahealth Executive Chairman Jeff Immelt said in a statement. Athenahealth has been facing takeover attempts since at least 2017, when Elliott Management first tried to buy the company. Elliott Management supports the Veritas-Evergreen acquisition. The transaction “represents an outstanding, value-maximizing outcome for Athenahealth shareholders,” Elliott partner Jesse Cohn said in a statement. Athenahealth will hold an earnings call later Monday. In a third-quarter earnings report released Friday, the company reported it booked less business compared to the same period of 2017. Revenue for the quarter was $329.5 million, according to the company’s new accounting standards, and $331.4 million according to the old standards, up 9% over the year-before quarter. Athenahealth’s stock was up nearly 10% between market close on Friday and the middle of the trading day Monday. From large hospitals to small clinics, providers are pursuing different functionalities in the secure communications they purchase, and the industry is responding to those demands. But wide variation exists in what vendors are currently offering to meet various needs, a new KLAS Research report finds. Acute care organizations tend to want broad communication platforms that facilitate communication enterprise-wide, while ambulatory facilities more often opt for HIPAA-compliant messaging. After functionality, cost is the most important factor behind lost sales. Vendors that offer enterprise pricing, such as Cerner and Epic, are more likely to clinch new deals, since customers know what they will get for the price and don’t feel they’re being nickle-and-dimed, according to KLAS. KLAS surveyed 100 acute care, ambulatory and post-acute care organizations to see which vendors they considered, what drove their decisions and how they rated the vendors they chose. As EHRs become ubiquitous in healthcare, such questions will shape how the sector evolves. When it comes to consideration, retention and performance, Epic, Voalte and TigerConnect all do well. Epic’s broad EHR market imprint, enterprise pricing and reputation for quality products and services makes it a dependable choice for many acute care organizations, KLAS says. Customers also appear confident the product will improve over time. Voalte’s broad communication platform is also viewed as above average in meeting acute care facilities’ needs. Secure messaging vendor TigerConnect, formerly TigerText, has wide name recognition as a cross-industry vendor, but less scores due to immaturity of its broader platform. The top two reasons organizations consider and settle on one vendor over another are product functionality and having a standing relationship with the company. Voalte and Vocera rank highly here because both have communication platforms offering a range of functionalities, such as VoIP, alarm routing, nurse call tools, mass notifications and labs, according to the report. EHR integration is the next most important factor, and Epic and Cerner both score marks here, though their platforms are less optimal than some others, according to the authors. Organizations are also looking for vendors that offer continued development of their platforms. Spok and Imprivata have lost potential customers because they have been slow to develop new functionalities and improve integration, the report says. The report points to possible disrupters in the mix as well. A good share of acute care hospitals that consider Telmediq and PatientSafe Solutions are choosing to go with the vendors, citing high quality and confidence the companies can deliver on communication platform needs. Providers are drawn to Telmediq’s robust physician scheduling and PatientSafe Solutions’ BPOC and nurse documentation. Moreover, both companies offer enterprise pricing. However, it remains to be seen whether these vendors can scale up to meet growing demand, KLAS says. Many American doctors are pessimistic about the practice of medicine. This unease includes concern about their practice’s financial stability and administrative management, as well as use of EHRs, according to a new Leavitt Partners white paper. Leavitt Partners, which conducted a national survey of 621 physicians between June 2017 and July 2017, found that 38% of doctors surveyed had an overall pessimistic outlook on the practice of medicine today. That feeling was evident among all types of physicians, though some doctors were more negative than others. The survey found that long-time doctors and solo practitioners were more likely to be pessimistic than other doctors. Physician satisfaction can influence patient safety and quality. Low morale can also lead to health problems, burnout and high turnover. David Muhlestein, one of the authors of the paper, told Healthcare Dive in a statement that one key to the survey results is that there isn’t one specific type of physician who is pessimistic. “If there were, we could focus on those physicians and how we could improve their circumstances. Instead, we found that a pessimistic outlook can affect any physician and that a lot of factors associated with pessimism are on the practice-level,” said Muhlestein, a chief research officer at Leavitt Partners. The survey found that 41% were either very optimistic or somewhat optimistic, 21% were neutral and 38% were somewhat pessimistic or very pessimistic. Muhlestein said one strong trend was that older physicians were more likely to be pessimistic. Nearly half of doctors surveyed with at least 20 years practicing medicine said they have a negative view. That’s compared to one-third of pessimistic physicians with less experience. Nearly two-thirds of physicians said they’re not confident in their practice’s financial stability. Slightly more than half aren’t confident about their practice management. A little more than half believe their EHRs hurt the ability to provide quality patient care and a similar amount aren’t satisfied with their EHR system. Doctors not happy with their EHR were significantly more likely to be pessimistic. The study authors warned that pessimistic providers are also cool to the idea of value-based payment models. Most pessimistic physicians don’t plan to transition to global or bundled payments and are also less likely to want to change care delivery. Nearly half of those physicians said they’re not expanding the role of non-physicians to deliver care. Only about one-quarter of optimistic doctors were resistant to the change. The study authors suggested some ways to reverse pessimism, including strengthening organizations (such as dissatisfied solo practitioners merging with small group practices) and improving EHRs, so they’re more user-friendly and fit into a doctor’s daily workflow. They also suggested that policymakers and stakeholders must keep in mind how value-based payments may affect physician satisfaction. “Empowering a variety of physicians to help shape new programs and initiatives may help to improve physician satisfaction, thereby hastening the move toward value,” they wrote. The results are the latest to show morale issues for physicians. A recent study by JAMA found that physician burnout starts as early as medical school and residency. A recent Doctors Company National Survey of Physicians found that seven out of 10 doctors wouldn’t recommend healthcare as a profession. 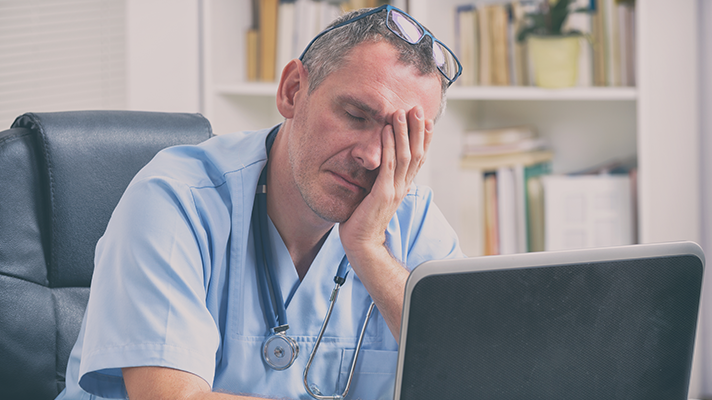 Respondents to that survey blamed EHRs and regulations for causing burnout. That survey also found little interest in bundled payment programs. The recent Medical Group Management Association 2018 Regulatory Burden Survey also cited concerns about regulations and EHRs. That survey found that 86% of 426 medical group practices surveyed said regulatory burdens increased for their medical practice over the past year. The MGMA survey respondents also said Medicare and Medicaid value-based programs increased regulations. More than three-quarters added that those value-based payment initiatives didn’t improve quality of care. All of these studies point to not just physician wellness and quality of care problems, but burnout also costing health systems and hospitals as much as $1.7 billion a year. This problem goes beyond morale and patient safety. It can also hurt a hospital’s bottom line.